About 80 dragon boat paddlers took to Launceston’s North Esk River on Saturday afternoon for the second annual dragon boat race and festival. Described by its competitors as Australia’s fastest growing water sport, the event saw teams from across the state race down the North Esk River in a number of unique dragon boats. Organiser Kelly Broomhall, of the North Esk Dragon Boat Club said the race and festival were started to attract new fans of the sport and to encourage people to enjoy the Launceston Seaport. While the races took place, the Seaport Boardwalk played host to a market that incorporated Taiko Drummers and Belly Dancers and a live band. Ms Broomhall said while the event was still in its infancy, she hoped the day would become a regular November attraction for Launceston. The first dragon boat festival was held 18 months ago. 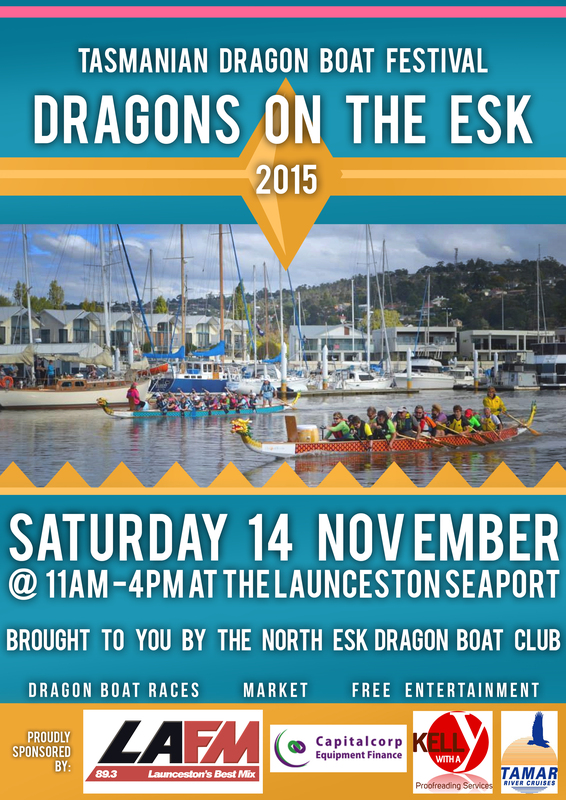 Saturday’s competitors hailed from dragon boat clubs in Launceston, Deloraine, Devonport and Hobart. The Tasmanian Dragon Boat Festival : Dragons on the Esk would not have been the success it was without the generous help from our sponsors who are very important to this event. LAFM celebrates 85 years in December, serving the Launceston and Northern Tasmanian Communities. Capitalcorp Equipment Finance: when you want finance for your next car, truck or machinery, call Steve Brumby, your local finance broker who makes the finance process easy. Funding your future! The North Esk Rowing Club is one of Tasmania’s oldest, dating back to 1899. In 2006 the club moved to Lindsay St, opposite the Seaport where members currently enjoy one of the best clubroom facilities in Australia with some of the best water that can be found anywhere. Bringing pride back to the professional. Are you unsure of your grammar or spelling? Do all the links on your website lead to the right place. Contact Kelly with a Y for all your proof reading needs. Fish ‘n Chips Seaport, 30 Seaport Boulevard. Open 7 days per week from 11:00am. Specials changing daily, please check specials board for details. Tamar River Cruises has been family owned and located at Launceston’s Home Point since 1996. They have a range of cruises running throughout the day. Their Cataract Gorge Cruise runs daily. Bunnings Warehouse is Australia’s largest household hardware chain with stores in Australia and New Zealand. The local Launceston stores are located in Invermay and Kings Meadows.